STELARC: New York, Berlin, Melbourne, Tokyo – and now Toowoomba! 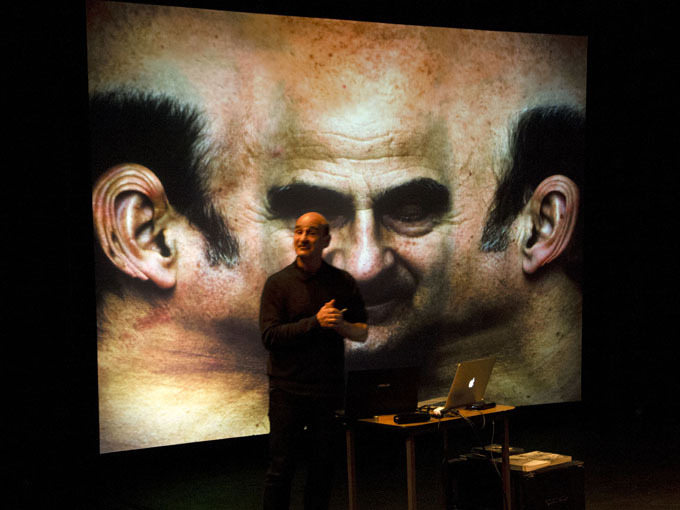 On Wednesday August 22, 2012 Stelarc presented two lectures about performance art at the University of Southern Queensland. 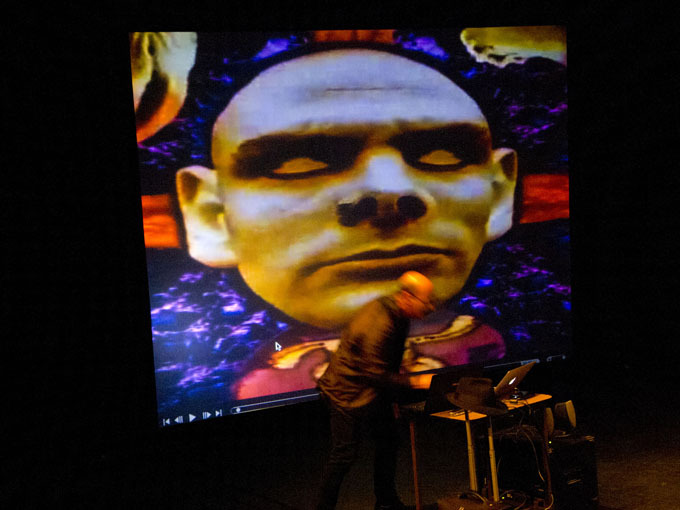 Local USQ students and lecturers, TAFE students and teachers as well as members of the extended Toowoomba arts community reveled in the opportunity to see and hear an artist of Stelarc’s stature in their own town. Usually they would need to travel to the above mentioned big city locations to even come close to a Stelarc event. 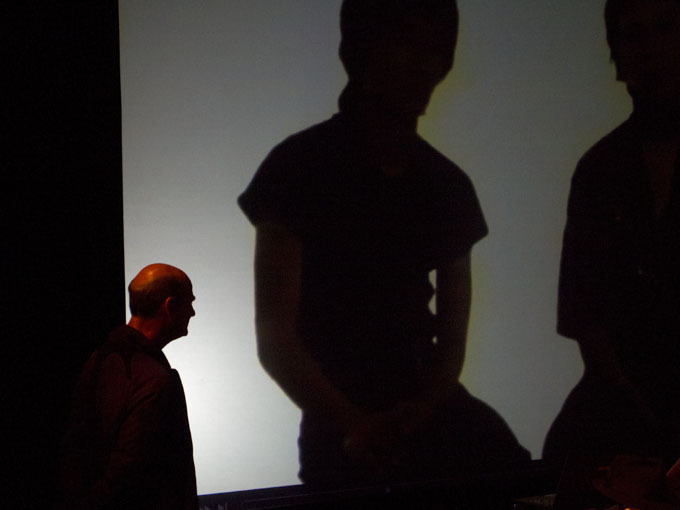 The opportunity for Stelarc came about as he visited local friend Michael Cook, an offer was made to connect with the local community and USQ was approached to provide a venue. Amazingly no charge was made for those to attend and the Uni supplied a light supper for attendees to the evening presentation. 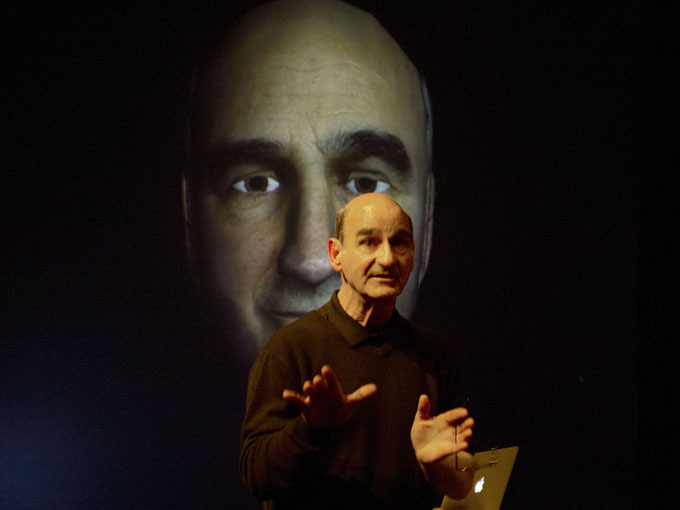 Thank you to Stelarc, Michael and USQ for their respective generosities. What follows is a montage of images by Doug and text by Vicky as a record and reflection on the event. 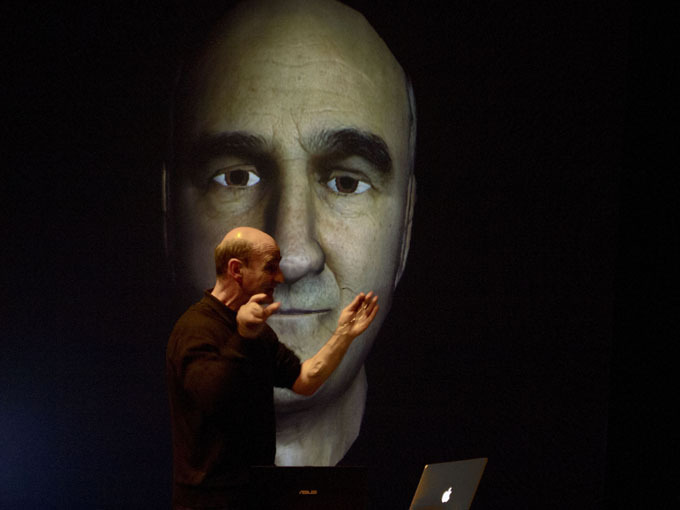 Stelarc immersed the audience in the intellectual discourse and unsettling condition of the technological age. As an internationally respected artist, he has sustained a significant investigation on what it means to be a human. 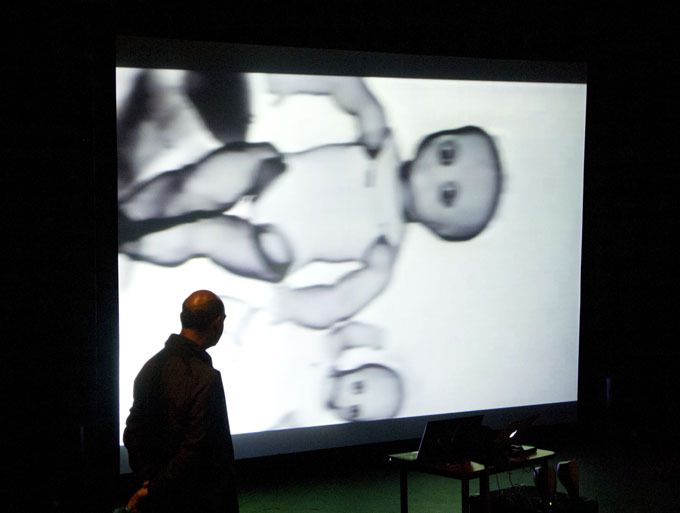 In his performance/lectures, Stelarc recounted technological advances, including the organ printer, advanced robotics and AI, that drive his philosophical and artistic enquiry. Through this visual and philosophical presentation, we were confronted with the concept of our emergent post-human state. Should we consider that we are now monsters? Are we breaking free from the human certainty of mortality—evolving into an early form of immortality? 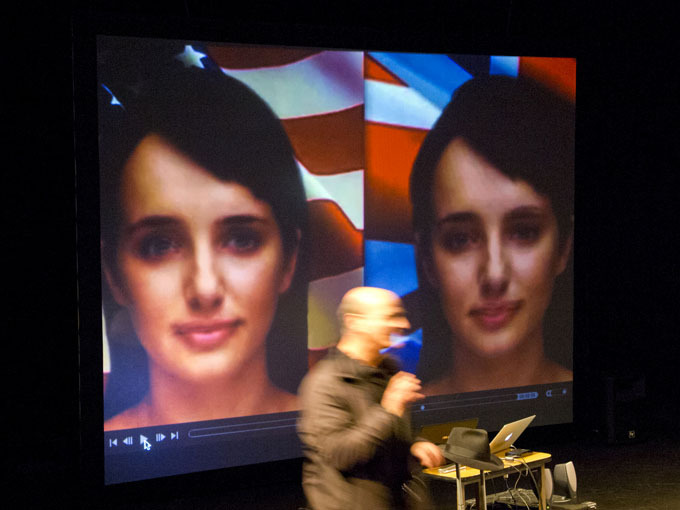 Could we just ‘be’ a digital database—an artificial consciousness made up of memories, emotions and ideas that are supported by the promise of replacement parts and eternal connectivity? This discussion may seem to be in the domain of philosophers, ethicists and scientists. But everyday there are new technological and medical procedures that intervene on, or replace our human-ness. 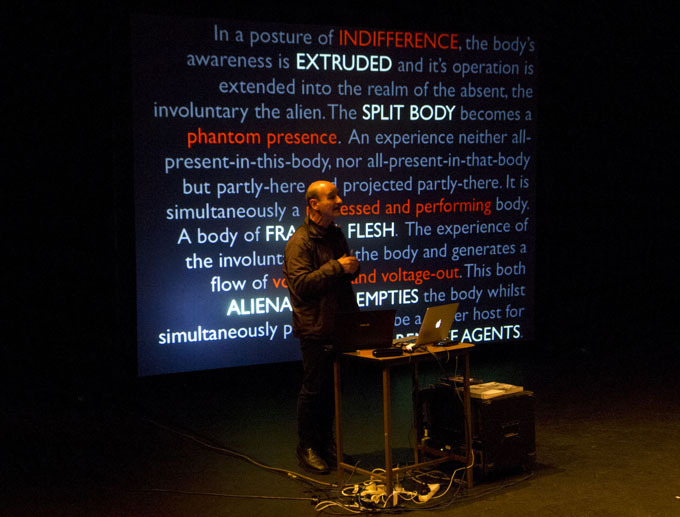 As we consider our future in this post-human condition, Stelarc’s “contested futures” opens up the possibilities for a number of agencies to direct the evolving human narrative. I ponder the historical human exploitation of ‘natural’ machines and knowledge since the Renaissance. What contingencies would Charles Darwin have envisaged in the event that his biological evolution had incorporated machines? Perhaps also the believers of Intelligent Design may also now need to consider the agency of their God in this evolution of the post-human? As we all benefit from machine interventions and technology in some way we cannot escape from this present future. Sharing this history, there are ‘others’. Our bodies and our environment are constituted by these “other”, non-artificial, nonhumans. They are totally unaware of our post-human evolutionary path. Their existence is in many ways linked to human existence. In their place in the world these nonhumans arguably have acquired ‘intelligence’. Unavoidably they will be actors/actants in the milieu of humanity’s “contested futures”. 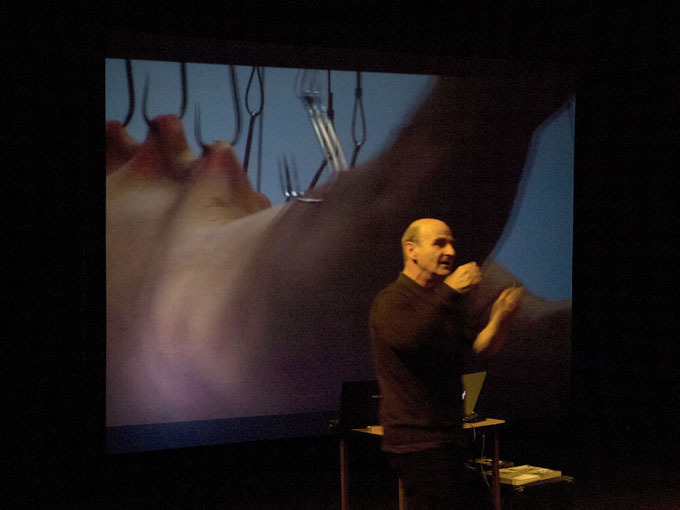 Thanks Stelarc, for your memorable and stimulating lecture/performances. Your line of inquiry evokes more and more questions. In a metaphorical way perhaps we are all stripped bare and suspended in the gravity of time, space and place as we, the ‘audience’, consider and are challenged by, our own concept of humanity.